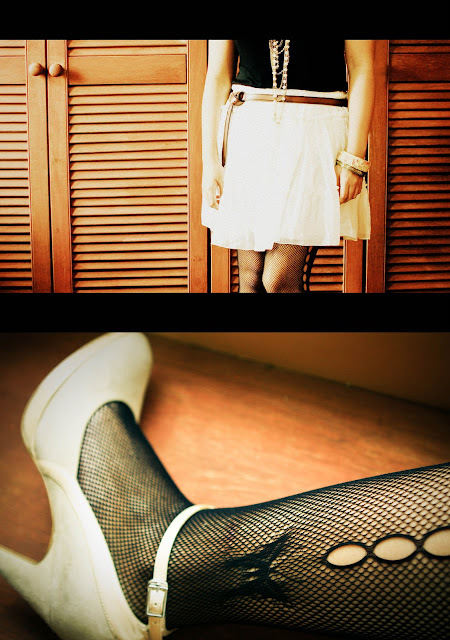 Received these two adorable tights/stockings from Citrusox. These fishnet stockings are part of Citrusox newest collection and not like ordinary fishnet stockings, all of them have gorgeous pattern. Pair them in two different outfit with black and white theme. I use element of lace in one outfit and leather dominant on the other one. It's like yin and yang, but both are still in my style category. A little bit of contrast mixing to show you how these stockings can be incorporated in your different outfit. Citrusox stocking with side pattern. Zara lace top. 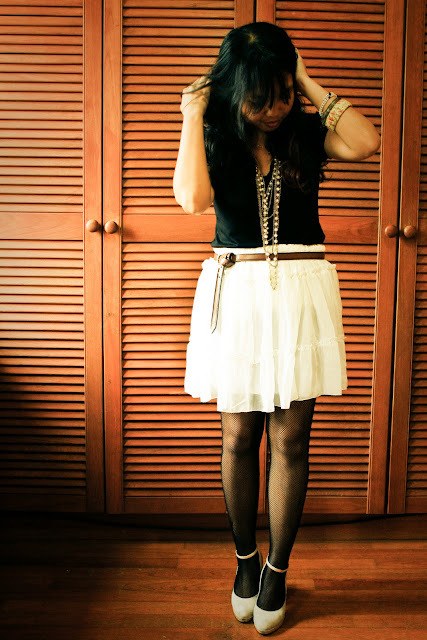 MDS chiffon skirt. Zara leather belt. Charles&Keith ankle strap shoes. F21 pearl layer necklace. F21 gold bangle. local shop flower bangle. Madame Butterfly pearl bracelet. Citrusox flower lace stocking. F21 white sheer top. unbranded leather jacket. Charles&Keith ankle strap shoes. Join Citrusox giveaway on facebook for my readers! Citrusox is giving away three pairs of their new collection of black fishnet stockings to three lucky readers!! Find more detail on their facebook page here. Either way is cute and adorable. 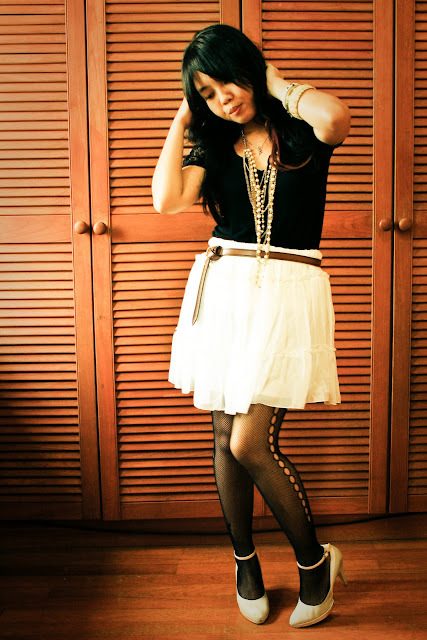 The tights has its own statement already so I think it's smart to make such a black & white paired separates! the tight is just really suitable when you want a feminime look and yes on the other hand it works well when you wanna have a grunge punk kid look! i love the combo of leather and lace! I love both outfits!! The second is my favorite!! I love it!! these are fabulous...i joined of course and mentioned you! Am super in love with lace! Love those looks! The stockings are gorgeous! Both stockings are so cute and versatile..
so lovely. x hivennn p.s enter my giveaway? oh wow this outfit is stunning. i simply love the colour scheme. the tights and the shoes are just the perfect details for this ensemble. Love the butterfly pair! They look so pretty!!! Those shoes are amazing!! You look great. thanks for following. I am following you now too. By the way I love your dresses!!! I really like leather and lace, great outfits and shoes! those tights with the side cut-out holes are obsessively cute! love the rockroll vibe in the leather jacket! I like both combos. Very bold. I totally could duplicate with my stuff but not sure if I would have the guts to pull it off. And I am usually pretty brave and bold. Oh, Thank you so much for visiting my blog and the nice get well comment. love those stockings!! love the lacy detailing on it!! love your tights! x hivennn p.s enter my giveaway? omg you outfits are sooo beutiful! i live it!! In love with both looks, but I think I would wear the first outfit. I love the skirt and it's such a great contrast between your tights and skirt. the outfits are both really pretty, but my fav is the 1st, so sweet!!! lovely outfit! that leather jacket is so pretty! I love the pearls with this outfit. I love the biker jacket. love your shoes fhen!how ar yu btw? 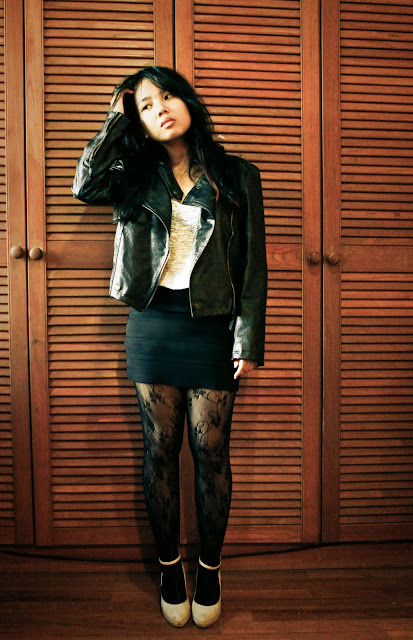 love leather and lace!Great blog! Follow you) Follow me? Thanks a lot to stop @ my blog,I'm a new follower!!! Leather and lace go perfectly together! thanks for your comment on my blog:I think yours is super-amazing and very inspiring. I follow you now, hope u can follow me back. p.s.your outfits are beuatiful...the thights in this...super! I Loveeee the whole outfits, specially your adorable stockings..Xoxo!